This luxury house “Emerald” is located on the exclusive Solana resort-style gated community, less than 8.5 miles away or about 15 minutes drive from Disney World. With 6 bedrooms (three master bedroom suites) and 5.5 bathrooms, it can comfortably accommodate 12-14 people. This lavish styled home is beautifully furnished and equipped with everything a discerning vacationer should requires. After a long day at the attractions you can relax either in the spacious family or living room watching cable TVs and DVDs or get into the sparkling-clear pool and bubbling spa pool to soothe away any tension. Under the shaded lanai you can eat, drink or read your favorite books while watching your kids and others splashing in the pool. The pool has a removable safety fence for extra protection for your young children. 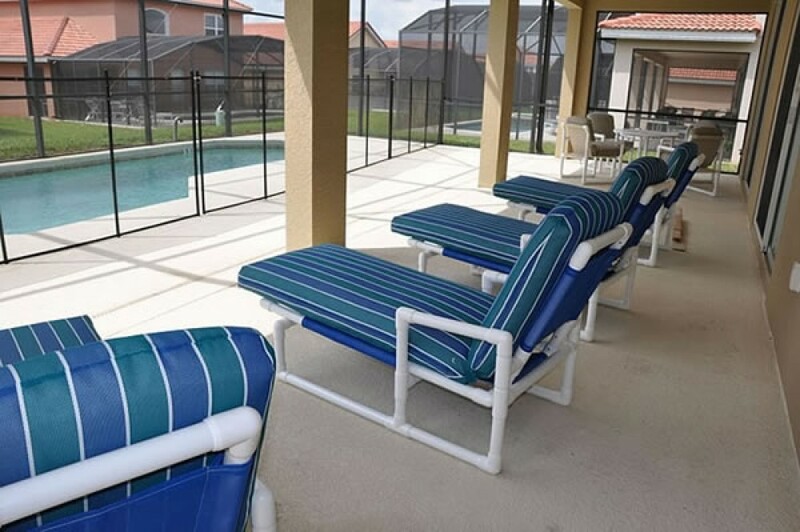 All guests have free access to the Solana Resort clubhouse that has excellent amenities like the soft-sand volleyball court, children’s playground, high-speed Internet room, sundry shop and a state-of-art fitness room.